New Delhi, February 26: Hours after Indian Air Force (IAF) conducted Surgical Strikes on terror launch pads of Jaish-e-Mohammed (JeM) in Balakot, Chakothi and Muzaffarabad on Tuesday, photos of the destroyed camps are doing rounds on social media. In of the picture tweeted by the news agency ANI, flags of USA, UK and Israel painted on staircases were seen in the JeM facility in Balakot. As per the intelligence sources, Ammunition dump of the terror organisation was also blown up in Balakot. The dump had more than 200 AK rifles, uncountable rounds hand grenades, explosives and detonators. Here are the Pictures of the Terror camps destroyed in the IAF strike. On the intersecting night of February 25 and 26, India conducted Surgical Strikes on terror JeM terror camps in Pakistan Occupied Kashmir (PoK), killing hundreds of terrorists. 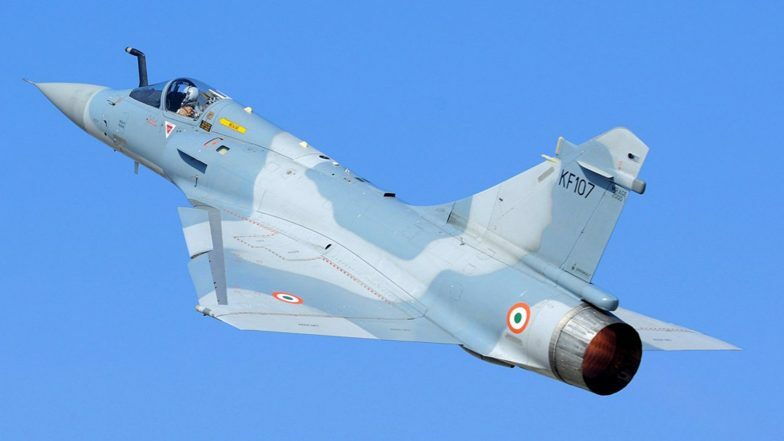 IAF’s 12 Mirage-2000 aircraft dropped almost 1000 Kg bombs on terror camps in Balakot, Chakothi and Muzaffarabad. The terror launch pads were completely destroyed in the strikes. Surgical Strike Hero Lt Gen DS Hooda Compliments Modi Govt and IAF For Strikes on JeM Camps Across LoC. During its speech in Churu, Prime Minister Narendra Modi hailed the IAF’s action. Congress president Rahul Gandhi also congratulated the IAF pilots who conducted the Surgical Strikes. The IAF’s actions came almost two weeks after the February 14 Pulwama Attack carried out by the JeM. Forty Central Reserve Police Force (CRPF) soldiers were martyred in the suicide attack.